This lovely holiday villa is for rent near Cala Carbo, within walking distance of the beach (10 minutes). 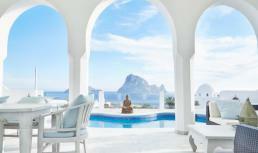 Villa Blanca comprises 4 bedrooms, 3 bathrooms, air conditioning, internet and spectacular sea view! Villa Astra is for rent near Cala Tarida on the western coast of Ibiza, only 5 minutes from the beaches of Cala Moli, Cala Tarida, Cala Carbo and Cala Vadella. Lovely holiday villa for 10 with 5 bedrooms, 4 bathrooms, private pool, WiFi internet, air conditioning and stunning sea view! This lovely vacation villa is for rent near San Jose, within easy reach of all the well-known beaches on the western coast of Ibiza. Vacation villa Trisca comprises 4 bedrooms, 2 bathrooms, air conditioning, WiFi internet and breathtaking sea view! Villa Palmador is for rent near Es Cubells, close to the well-known beaches on the south-eastern coast such as Cala Jondal, Cala Carbo and Cala d´Hort. Spacious family villa for 12 with fenced pool, air conditioning, WiFi internet and spectacular sea view! Villa Maxima is for rent in a quiet area near Cala Tarida on the western coast of Ibiza, not far from the beaches of Cala Moli, Cala Tarida, Cala Carbo and Cala Vadella. Lovely holiday villa for 8 with 4 bedrooms, 3 bathrooms, private pool, WiFi internet, air conditioning and stunning sea view! Villa Rural is for rent in a quiet area between San Antoni and San Rafael, approx.. 8 km. from the well-known beaches such as Cala Bassa, Cala Moli, Cala Tarida etc. Wonderful, modern holiday villa with 5 bedrooms, 4 bathrooms, salt water pool, Jacuzzi, WiFi internet, air conditioning and a panoramic view of the surroundings! Villa Madeira is for rent in a quiet area between San Jose and San Rafael, approx.. 6 km. from the well-known beaches such as Cala Salada and Cala Gracio. 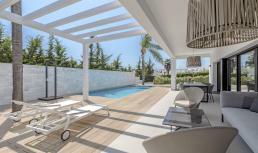 Lovely, modern holiday villa with 4 bedrooms, 3 bathrooms, private pool, WiFi internet, air conditioning and panoramic view of the surroundings! 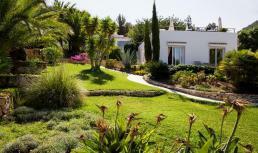 Villa Carroca is for rent near San Jordi, only 3 km. from Ibiza Town and 4 km. from the well-known beach Playa d’en Bossa. Lovely holiday villa for 8 with private pool, air conditioning, WiFi internet and stunning sea view! Villa Joya is for rent in the exclusive urbanization La Joya , only 100 m. from Cala Llenya, a lovely sandy beach. Villa Joya accommodates 8 persons and has a private access to a small rocky beach (50 m.) Wonderful holiday villa with private pool, air conditioning, and WiFi internet! Villa Maria is for rent near San Josep in southern Ibiza, only 7 km. from Ibiza Town and 6.5 km. from the well-known beach Playa d’en Bossa. Lovely vacation villa for 8 with private pool, air conditioning, WiFi internet and stunning sea view!